We’ve loved Downton Abbey since it first appeared on our screens just over two years ago, and we know you have too. We are so sad the latest series has finished and left a hole in our Sunday night TV schedule. 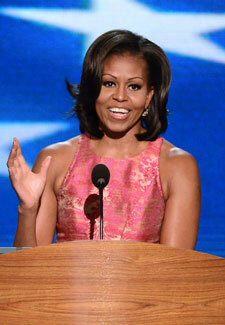 And it appears we’re not alone, as it’s been revealed that Michelle Obama is a huge fan of the show. America’s First Lady requested to have the latest series sent over to the White House on DVD so she and husband Barack – you know, the President of the United States of America – could watch the show first, before it airs in the US on 6 January. We hope Michelle’s kept clear of all spoilers – including that shocking episode mid-series. Our lips are sealed, just in case she’s reading!